What is Tokyo Record Bar? I ask myself this as Dr. Dre's "The Chronic" pulses through the old school Hi-Fi amplifier. The needle wags back and forth like a happy dog's tail and I could feel the heat from the tubes with every hit of the kick, or maybe it was the heat of the kitchen I was parked in front of having gotten there early to claim one of the coveted kitchen counter seats for my own. Tokyo Recod Bar reminds me of those basement high school parties at your friend's house while the parents are away. This time you don't have to refill the liquor bottles with water and the food is way better, even though there is still pizza. Located under Air Champagne Bar, Tokyo Record Bar offers two izakaya tastings a night (6:30pm & 8:30pm) followed by drinks and snacks until the wee hours of the morning. The tastings are an intimate gathering (only around 16 seats or so), there is no menu other than one for drinks and one for music. A music menu? Yes, all the diners a submit song to build the dinner playlist so the ambiance is curated by the you and those eating with you. You are also encouraged to interact with and talk to your fellow diners. One of the diners next to me also worked in the hospitality industry so we did some networking. In addition to the music menu there is a sake menu. The different thing about this menu were the offerings described by the predominant flavor profile so you do not have to know a name or origin; I found this very handy. You are able to order by the cup, carafe or bottle. The experience started with a complementary cup of sake, some flavored nori chips and picked daikon. Our host introduced herself and the rest of the staff for the evening and then asked everyone to pick a song from the song menu which was categorized by genre. Once drinks were ordered and songs were picked the host started spinning, delivering music to our ears while at the same time food was being delivered to our mouths. Starting things off was a fantastic but seemingly simple caviar sushi. Vinegared rice topped with oestra caviar and little crunchy balls of rice to give a little texture. Another dish was a sashimi of some amazing fish but I forgot what type because I enjoyed myself too much. It was dressed with jalapenos, avocado and finished with some sizzling sesame oil. I was one of the first to arrive for the night so I claimed a primo seat at the kitchen counter.Got to love watching those guys hard at work creating fantastic dishes.it's like watching music in motion complete with ebbs and flows in service. By far my favorite dish of the night was the tempura maitake mushrooms covered with bonito flakes. I could eat this everyday for the rest of my life and be happy. Crunchy and meaty at the same time, you just have to hope they serve this if you go. The evening ended with a serving of yuzu shave ice. Texture -wise it was a bit crunchy for shave ice but the yuzu was a nice palate cleanser. As a parting gift they did a home-made Sicilian style pizza with a square slice for everyone. This was actually really good with a crunchy crust soft bready insides. For $50 you get 7 Izakaya sized courses, drinks are extra, music is included. This is not for everybody. However if you are looking for something different that is interactive, mysterious, intimate and fun, Tokyo Record Bar may be for you. I enjoyed the surprise of what was coming next (during the reservation process you can notate any allergies). I enjoyed speaking to my fellow diners. I enjoyed the interactivity of picking songs and listening to what others picked - the playlist definitely leaned to old school hip hop, soul and funk. And they email you a link of your playlist so you can relive the memory. I am looking forward to doing it again and hanging out after dinner next time. Ah... Rotisserie Georgette, now serving Sunday brunch. A beautiful wooden bar welcomes you in from the cold and you are tempted to sit and warm up with a bourbon or a smokey Bloody Mary. A plump pickled shrimp helps offset some of that smokiness. The dining room beckons with similar warmth from what appears to be a fire in the semi open kitchen and muted browns framed by random antique mirrors and wall length tapestries. Waiters in their leather aprons looking like butchers take care of you and provide you with heart warming food. Nothing to fancy or fussy, solid good food. The signature Rotisserie Chicken served as a half chicken with a half roasted garlic, fries and mixed greens. The skin was crispy and topped with herbs, the meat both white and dark was moist and juicy. In other words, perfect. Classic Eggs Benedict comes with your choice of eggs on top of thick cut bacon, bresola or smoked salon. The hollandaise was one of the best I ever had, not too thick and with a nice lemony taste to it. The thick cut bacon was almost ham-like and delicious. Round out your meal with Georgette's house-made granola. So tasty with multiple types of nuts and sweetened with maple. This is served with non-fat yogurt and a blackberry compte parfait style. Georgette herself warmly greets every table and makes a connection with all of her guests. This is her baby and she has every right to be proud of what she has created. Do yourself a favor and keep this gem in mind for lunch, dinner and now Sunday brunch. 2017 is here and the craziness of the holidays have past. I am looking forward to sharing more this year and am starting with the first restaurant I have visited this year, Mamo. Mamo is in SoHo and is an off-shoot of the original in Antibes. They bill them selves as Italian hospitality and Provençal charm in NYC. It is a perfect Italian spot for those looking for a respite from shopping or for someone looking to celebrate a special occasion (they serve lunch and dinner daily). As soon as I walked in the door I was greeted and led upstairs. There is a beautiful bar (with beautiful staff to match) and a well laid out dining room. Whitewashed exposed brick and ceiling beams add to the warmth and charm of the space. The tables are a good size, not too close to each other and the chairs are super comfy; all following the white theme. The menu is varied and something for all palates and restrictions. The big draw and a transplant from the Antibes menu is the Focaccia al Tartufo (Truffle Pizza!) Anyone that comes to Mamo has to get this. It is a white pie with cheese and shavings of truffles, simple yet decadent. Their homemade gnocchi came with a meat ragu. It is a stick to your ribs kind of dish and perfect for the cold night. The gnnochi were like heavenly little pillows, so light ad they practically melted in my mouth. The ragu was nicely balanced; meaty with a tiny bit of acidity. 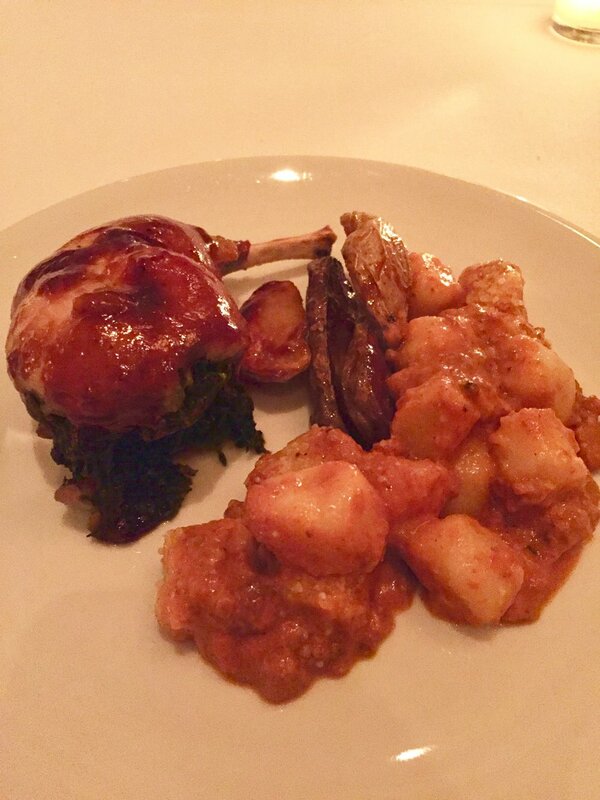 To try something different I went with the leg of rabbit stuffed with bits of foie gras and spinach. The leg was moist and the added flavor (fat) from the foie gras was nice. This was a nicely executed dish but the least favorite of the ones I tried. For dessert I went simple again with some warmed strawberries over vanilla ice cream. Cream and berries; Perfect. Finish with a cordial glass of Limoncello and your escape is complete. In summary, you have a warm space, congenial service and fantastic execution of simple dishes (which can be hard to do). Keep Mamo in mind when you are in SoHo or looking for a great place to spend time with friends or family. I remember when I first moved to NYC some years ago all the "upscale" restaurants were French. In fact the first really nice restaurant I ever went to was Le Cirque when it was still in the New York Palace Hotel. It was like a whole new world that I felt I was intruding upon. The experience was enlightening, both food and service. Since then I have slowly seen the decline of the "upscale" French restaurants with more and more "approachable" restaurants becoming the norm. I think it's great that there are these restaurants but sometimes you want to go to a special, upscale restaurant. The recently opened Vaucluse is a very nice mix of of both to me. The service and the food were definitely of the "upscale" camp and yet everything felt approachable as soon as I walked in the door. Located in the former Park Avenue Cafe space, Vaucluse is Chef Michael White's first French restaurant in NYC. Chef White has made a name for himself at Italian mainstays like Marea, Ai Fiori, Ristorante Morini and the former Costata. The space has two beautiful dining rooms and one bar area. The bar area is great if you do not want to do a blow out meal, there is even a "White Label" burger on the menu. The dining rooms have clean lines and are well lit, but really, let's get to the food. Two large stalks of tender white asparagus came with bits of smoked salmon in an inspiring dish. The ravioli with two pockets one for the rabbit and one for the reblochon cheese were like perfect pillows of ambrosial decadance. But the Pièce De Résistance has to be the Canard á l'Orange, roasted duck for two. They do a special aging on site and it is served with charred supremes of orange. The meat is so tender and is covered with a perfect layer of flavor (fat) and topped with a perfectly crisped skin. This might be a perfect dish both flavor and texture-wise. Enjoyed with a Pinot from Oregon I was in heaven.